Senior County Final This Weekend !! 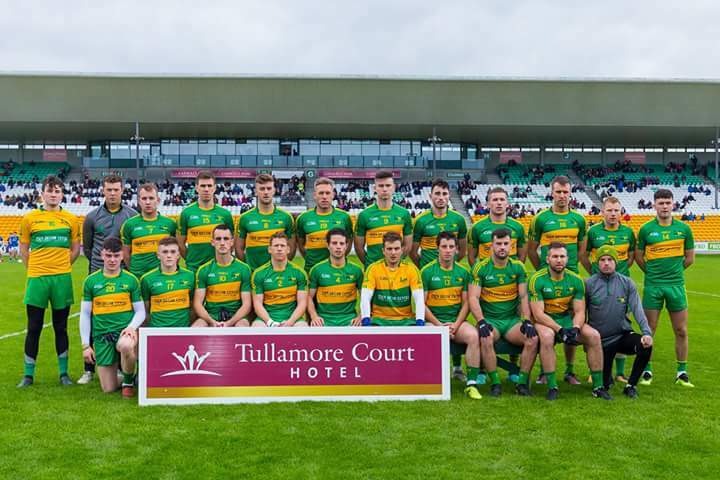 Very best of luck to Rhode Senior Footballer’s and Management team in the County final on Sunday at 4pm against Ferbane in Bord Na Mona O’Connor Park Tullamore. Lets Get Behind Our Boys !! Very best of luck to our U’9s & U’7s player’s who will be taking part in the half -time blitz on county final day . Its’ a wonderful experience from the young kids. Massive Congratulations to our own Rhode/Fahy Handballer Daithi Hope who retained his over 35’s A Singles Handball Title on Sunday last . Yet again a massive crowd attended our Breakfast morning for the second year in a row. It was a wonderful occasion and you could feel the excitement building for the county final next Sunday. We are so lucky to have such fantastic supporters who always get behind our teams events. Speaking on the clubs behalf PRO Robert Kellaghan Thanked all those who had attended the event and for their support all year in doing that he gave a special mention to Ray & Tina Dempsey for the wonderful food, Club Sponsor’s John & Orla Kilmurray Eden Decor, the wonderful ladies in the kitchen, Players & Management for making this a great occasion he thanked everyone again and hoped to see them all next Sunday. Joint Rhode Senior Manager Declan Gorman spoke next on what it means to the players and management to have such wonderful support behind them thanking everyone on the team’s behalf. The Draw then took place where Dympna Morris won the match ticket’s and Jody Kilmurray won the Rhode Top. Again Massive thank you to our great supporter’s . Ray & Tina Dempsey , John & Orla Kilmurray Eden Decor, the wonderful ladies & Men in the Kitchen, Players who served the food, park attendent’s all our local people who baked lovely bread and scones, OToole’s Bar & Lounge and Rhode Parish Enterprise for the tables, chairs and Cutlery etc.without your help it couldn’t have been done. Declan Cox thank you for the sound system always on hand when we call thanks a million. Roll On County Final Day. 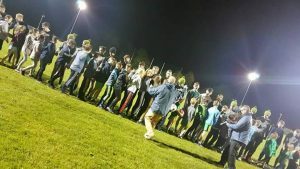 A super night was had in Fr.Dowling Park last Friday when a massive number of kids and parents’s turned out to wish the Rhode Senior footballer’s and management the very best of luck in the county final. Under-age Chairman Stephen Darby spoke of his delight with the turnout and said the best wishes of the parish were with the senior footballer’s Stephen also urged the young boys and girls to make sure they make plenty of noise when supporting Rhode next Sunday.It was then the turn of young Rhode fan Anna Mai Walsh of Fahy to gives us her wonderful rendition of the National Anthem Well Done Anna Mai you have such a lovely voice. Many Thanks again to the parents , younger supporter’s and all those who organised the event. A very Happy Birthday to two great Rhode People Martin Heavey and Mary-Joe Kilmurray and belated Happy Birthday to Dynpna Morris . There was no winner of the Rhode GAA Lotto Draw that took place on the 30th of September for a Jackpot of €20,000. The numbers drawn were 6 11 12 27. The club would like to thank all those who supported the draw and thanks to Killeen’s for the use of their premises and for their help and cooperation. The following matched three numbers and received €200. Deepest Sympathy to the Hickey family on the passing of Joe Hickey Ballyburley. Deeply regretted by his loving wife Nora, son Adrian, daughter Jackie, grandchildren Eoin, Sinead, Ryan, Caitlyn, Niall and Lorna, sisters Angela, Teresa and frances, sisters in-law brothers in-law, daughter in-law nieces, nephews, relatives and friends. Joe’s funeral mass took place on Saturday morning last in St.Peters Church which was followed by burial to the adjoining cemetery.